My extension activities encompass postharvest studies of temperate fruit crops with an emphasis on nectarines, fresh market peaches, plums, kiwifruit, apricots, persimmons, pomegranates, Asian pears and table grapes. Peach market life: Should we apply this concept? Understanding the role of pre-harvest factors that control fruit quality (taste) at harvest and after shipment. Developing systems to deliver more tasty fruit to consumers. Understanding skin discoloration and internal breakdown on peaches, nectarines, and plums under California conditions. Conducting studies on kiwifruit and stone fruit softening and ripening. Understanding consumer preferences based on fruit quality sensory attributes. Studying the overseas shipping requirements of fresh commodities. Crisosto, Carlos H., R. Scott Johnson, Kevin R. Day, Bob Beede, and Harry Andris. 1999. Contaminants and injury induce inking on peaches and nectarines. California Agriculture 53(1):19-23. Crisosto, Carlos H., David Garner, and Katia Saez. 1999. Kiwifruit size influences softening rate during storage. California Agriculture 53(4):29-31. Ritenour, Mark A., Carlos H. Crisosto, David T. Garner, Guiwen W. Cheng, Juan Pablo Zoffoli. 1999. Temperature, length of cold storage and maturity influence the ripening rate of ethylene-preconditioned kiwifruit. Postharvest Biology and Technology 15:107-115. Slaughter, David C. and Carlos H. Crisosto. 1998. Nondestructive internal quality assessment of kiwifruit using near-infrared spectroscopy. Seminars in Food Analysis 3:131-140. Mitchell, F. Gordon, James F. Thompson, Carlos H. Crisosto, and Robert F. Kasmire. 1998. The commodity, p. 1-7, In: James F. Thompson, F. Gordon Mitchell, Tom R. Rumsey, Robert F. Kasmire, and Carlos H. Crisosto (eds), Commercial Cooling of Fruits, Vegetables, and Flowers. Publication 21567, Division of Agriculture and Natural Resources. Crisosto, Carlos H., R. Scott Johnson, and Ted DeJong. 1997. 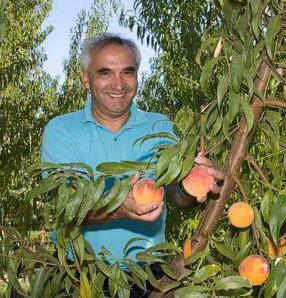 Orchard factors affecting postharvest stone fruit quality. HortScience 32(5):820-823. Cheng, Guiwen W. and Carlos H. Crisosto. 1997. Iron-polyphenol complex formation and skin discoloration in peaches and nectarines. J. Amer. Soc. Hort. Sci. 122(1):95-99.